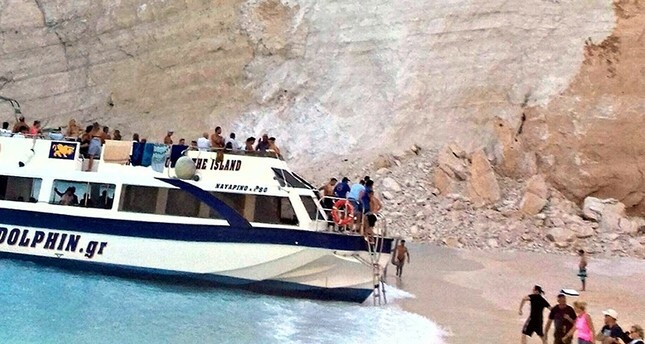 Cliff collapse on Greece’s ‘shipwreck beach’ injures tourists. Seven people were injured on Thursday when a cliff face collapsed onto Navigio Beach on the Greek island of Zakynthos, triggering a landslide. According to the Associated Press, the incident began when a large chunk of limestone fell from a cliff into the ocean, creating a large wave that caused several small boats to capsize. Rescuers from the local coast guard and the fire department soon arrived on the scene to evacuate the beach and prevent boats from approaching. Thankfully, none of the victims’ injuries were life-threatening. One woman was reportedly treated for a fractured vertebra.